For three winding transformers, the program automatically assigns the names TW-1, TW-2, TW-3, and so on. Primary Bus The bus that is connected to the main transformer winding, or the largest MVA winding. This bus must already exist on the one-line. You must be careful that the Primary Bus has approximately the same base kV as the transformer's Primary Rated kV. 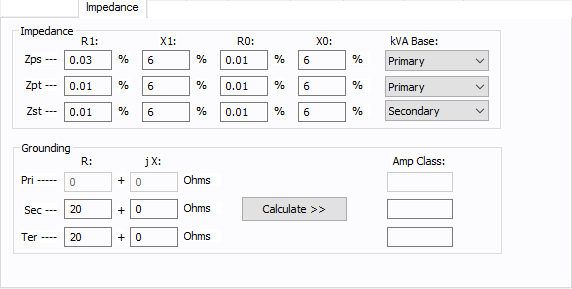 (However, EasyPower can model any off-nominal kV rating.) For reference, the Primary Bus base kV is displayed next to the bus name. Secondary Bus The bus that is connected to the secondary transformer winding. This bus must already exist on the one-line. You must be careful that the Secondary Bus has approximately the same base kV as the transformer's Secondary Rated kV. (However, EasyPower can model any off-nominal kV rating.) For reference, the Secondary Bus base kV is displayed next to the bus name. Tertiary Bus The bus that is connected to the tertiary transformer winding. This bus must already exist on the one-line. You must be careful that the Tertiary Bus has approximately the same base kV as the transformer's Tertiary Rated kV. (However, EasyPower can model any off-nominal kV rating.) For reference, the Tertiary Bus base kV is displayed next to the bus name. The transformer winding connection type, which is either "Delta" (D), "Wye Ungrounded" (Y), or "Wye Grounded" (YG). If "Wye Grounded" is selected, grounding impedances can be entered on the Impedance tab in the Grounding section. Type Type of transformer (oil, gas, dry, silicone, or vapor). This field is used to determine the rating capacity of the transformer for the power flow overload solution. Class Type of cooling used by the transformer. Various combinations of forced air, water and forced oil are available. This field is used to determine the rating capacity of the transformer for the power flow overload solution. Temp ANSI temperature rating of the transformer. Various combinations can be chosen and are dependent upon the type of transformer. Dual ratings such as 55/65 increase the overload capability of the transformer by 12 percent. Either core or shell type transformers can be selected. If Core is selected, the Z0% value on the Impedance tab is set to 0.85 of Z%. If Shell is selected, Z0% is equal to Z%. Tap kV / Tap% Tap kV of a winding. You can also specify the tap kV in terms of percentage of the rated value. If the actual tap kV is not known, enter the rated kV. Load tap changer control can be used to determine final tap settings if desired. EasyPower automatically adjusts the model to account for different taps, turns ratio and bases you select. MVA/kVA Self cooled rating of the transformer. Use to select the unit in MVA or kVA. MVA OL The overload rating is based on the temperature and class ratings. It is filled in using the Calculate button or you can type in a different rating. Transformer impedance is in percent on the self-cooled MVA of the winding and nominal voltage rating. The strict definition is the percent of rated voltage impressed on the high voltage winding to produce rated full load current in the short circuited low voltage winding. In this dialog box, Zps stands for Primary to Secondary, Zpt stands for Primary to Tertiary, and Zst stands for Secondary to Tertiary. Manufacturers provide impedance data in many different formats depending on the test facility and transformer size. The data entry format for EasyPower was chosen from one of the most common testing procedures. You can specify the impedances in any MVA base: the primary, secondary, or tertiary. R1 Positive sequence winding resistance in percent. X1 Positive sequence winding leakage reactance in percent. R0, X0 Zero sequence winding leakage impedance in percent. If you don't know this value, enter the positive sequence impedance (Z) for shell transformers (see the Form field on the transformer's main dialog box). For core transformers, use approximately 85% of Z. If you enter this value as zero (0.0), the positive sequence impedance is used. MVA Base The winding MVA based upon which the percent impedance value is specified. Use the Grounding area of the Impedance tab to enter grounding impedances. They only apply to wye grounded connections. The units are R + jX in ohms. If you only know the ground amperes of the circuit, divide the line to neutral voltage of the circuit by the amperes to get the impedance. This can be achieved in EasyPower by entering the Amp Class first and then clicking Calculate. If the transformer is grounded through a grounding transformer with a secondary resistance, this resistance must be converted to the primary winding. Only wye grounded transformers are modeled with grounds. Mid or corner tapped delta windings are not modeled. jX Transformer neutral ground reactance in ohms. 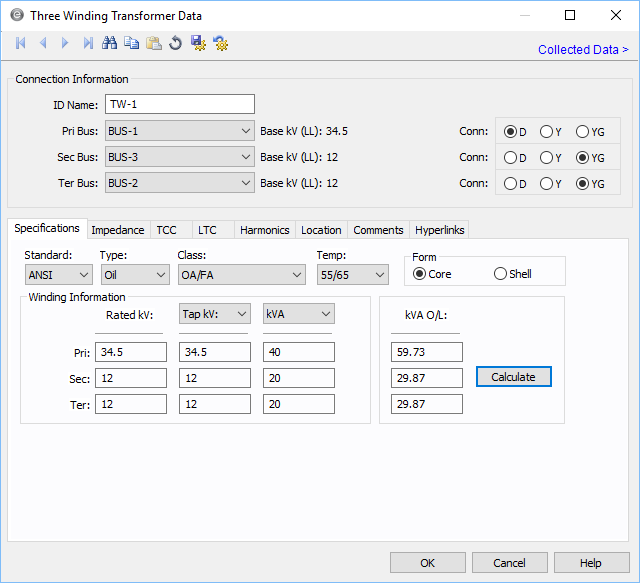 Step Size The default is 0.625 but you can type in your own percentage step size both here and in the power flow three-winding transformer temporary dialog box. Min Tap kV Minimum tap kV is used to determine the bottom limit to which the tap can be adjusted during a power flow analysis. This value should be the lowest tap on the transformer to get meaningful results. The default of 0.12 kV is not realistic and should be changed to the actual values if the LTC is used. Tap Load tap changers (LTC) can be placed on one or two windings of a three-winding transformer. Any combination of primary, secondary or tertiary is allowed, provided that they do not specify the same winding. Also, if only one LTC is used, it must be LTC #1. If the transformer does not have an LTC, select None for standard fixed taps. 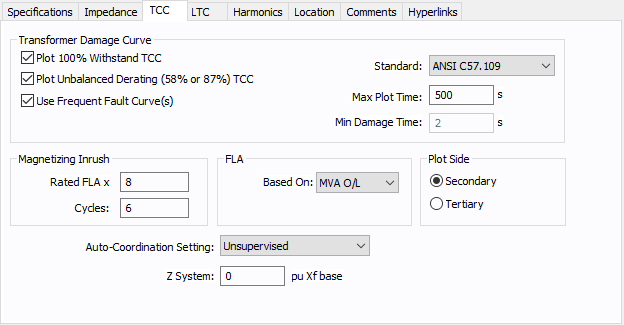 Fixed off-nominal taps can be entered in the main dialog's Tap kV field. Control value, which is determined by the Control Type field. MVAR: The value should be entered in actual MVAR rather than adjusted per-unit. To determine what MVAR range is appropriate for a given transformer size, determine the MVAR flow without using an LTC then multiply by .975-1.01 for an approximate starting place. LTC control is much more limited in strength and range than large generator control. Determines how the LTC model is used. Voltage: The LTC attempts to control the voltage of the bus on the same side of the LTC. For example, if LTCs are selected on both the secondary and tertiary sides, voltage is controlled at those buses. This works well if the secondary and tertiary sides are load buses as is common for split winding transformers. However, if the primary side is selected for the LTC and the secondary and tertiary sides are load buses, the primary side (source side) cannot control the load bus voltage. For this type of system standard, fixed taps works well. Pri Fundm Amps Calculated rated amps on the primary side. Sec Fundm Amps Calculated rated amps on the secondary side. Ter Fundm Amps Calculated rated amps on the tertiary side.